Live in a rural area? 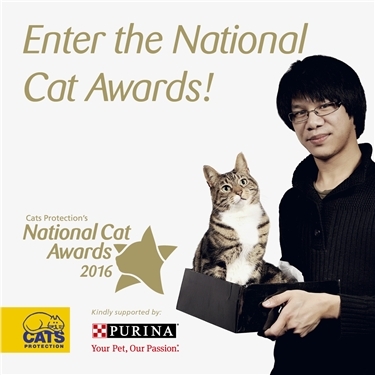 The search is now officially on to find the nation’s top cat, with entries now open for Cats Protection’s National Cat Awards 2016! If you are the owner of an extraordinary feline or a moggy with a miraculous tale to tell, now’s the time to nominate your cat. Perhaps your cat has saved the day with its heroic behaviour, or had a positive impact on your wellbeing? From fabulous friendships to unbreakable bonds, we want to hear your remarkable stories on how your cat has enriched your life. This competition is open to all living cats in the UK. Winners will be announced at a glamourous awards ceremony on Thursday 4 August at London’s Savoy Hotel, where celebrity judges will present awards and announce the overall National Cat of the Year 2016. Each winner will receive a trophy and three months’ worth of cat food for one cat. To find out more about our National Cat Awards 2016 and make your nominations, click here.